Verbal quotations are only provided as general information. Legally binding is the written agreement between the Academy and the customer. Whilst the Academy has a very good reputation for prompt delivery and will always strive to meet deadlines, dates or periods for completion of translations are only best estimates and the Academy not liable for the consequences of any delay for any reason whatsoever. In particular, the Academy will not be liable in case of Force Majeure or if a translator's computer or Internet provider has a downtime and the translator cannot deliver in time. The Academy is not liable for the obligations of the customer. The Academy will do its best to provide high quality translations for each of its customers. However, if the customer should have nevertheless a complaint, he shall notify the Academy within five (5) days of the receipt of the provided work. The Academy agrees to rectify at no charge any inaccuracies, errors or omissions within the particular work. Our liability will be no more than to rectify any such alleged inaccuracies, errors or omissions that we feel to be proper. The customer shall always give the Academy the opportunity to correct any alleged issues within the translation. The Academy shall not be liable to the customer or any third party in any circumstances whatsoever for any consequential loss or damage of any kind (including loss of profit or injury) resulting from the use of translated material. The customer shall indemnify the Academy against all claims and demands for any such consequential loss, damage and injury. 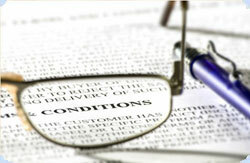 It is the customer's duty to prevent consequential loss, damage and injury when using the provided translations. While the Academy will pay all due attention to provide an accurate and idiomatic translation of the customer's original text, the customer must accept that a translation reads differently than the original and that no liability can be accepted by the Academy for any alleged lack of advertising or sales impact or even injury. The customer has to prevent these rare circumstances himself. A translation reflects the quality of the original text. If the material to be translated contains poorly expressed concepts, wrong choice of language, typographical mistakes, incomplete text, or factually incorrect text, same inadequacies may show up also in the translation. The Academy is not entitled to chance the source text unless authorized by the customer. The Academy might notify the customer of such inaccuracies. The Academy will not accept any criticism of any translation where the source text contained any of such problems. The Academy, its employees and translators agree to handle the files and the translation of the customer confidentially to the degree permitted by law. The Copyright of the translation is the property of the Academy and will be passed on to the customer after full payment of the translation. These conditions shall be interpreted for our main office and all international branch offices of the Academy in accordance with law in India. Exclusive jurisdiction lies with the courts of Mumbai. All Rights Reserved El Dorado Academy Website Designed and Developed by Ajcon IT.com Ltd.